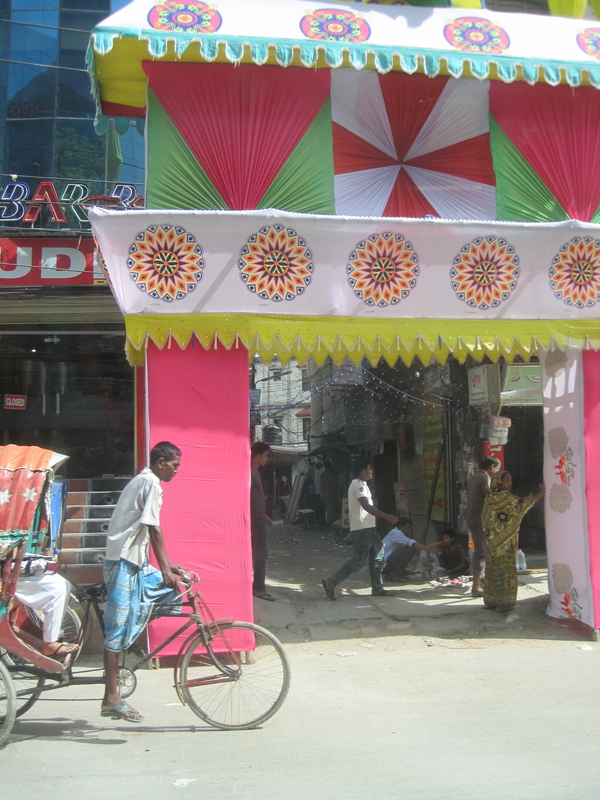 Life in Dhaka has provided us with many new experiences to share with our friends across the world. Something exciting happens every day and today was no exception. I awoke this morning to find a visitor in our bed staring right at me. Since neither Janis nor I were totally awake I mumbled something strange to the effect of, “Janis, I think I see something and I don’t like it!” He picked up the clock because we’ve been on a crazy schedule with jet lag, assuming we had slept in again. I just pointed to the corner of the bed and he sat up to get a better look. 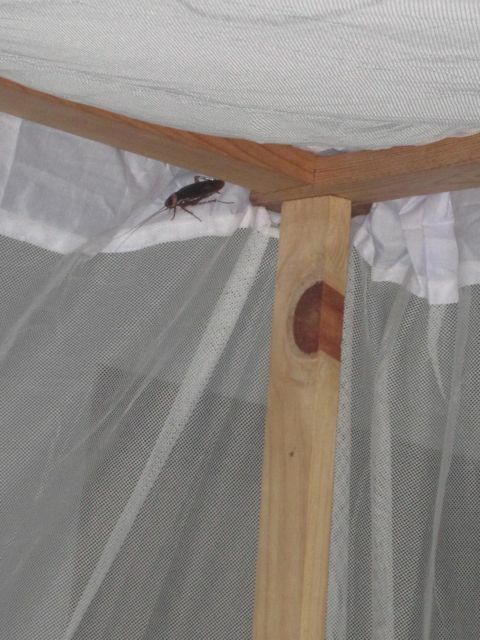 Yes friends, there sitting in the mosquito net was a gigantic cockroach wiggling his antennae to offer his morning greetings. I squealed and then gagged as I considered snuggling with that thing in the night, and quickly made my way out from under the mosquito net while Janis kindly took care of our uninvited guest. I was prepared to ward off mosquitoes while in Bangladesh and even came equipped, but these persistent cockroaches were not on the agenda. They’re large, lively and seem intent on surprising me in random locations around the house. After considering how that fellow might have joined us under the bug net, we decided to clean beneath the bed. It is a four poster bed with 4 compartments beneath. We cleaned underneath the entire bed finding all manner of “treats” that sufficiently turned our stomachs. When we had finally disinfected the space, we put the bed all back together feeling more at peace about getting a good night’s rest tonight. I fluffed the blanket one last time to get it straight and something came running out. I squealed, naturally, but leaned in to get a closer look at the new culprit. Can you guess what it was? A teeny, tiny, lightning-fast lizard! What? My first instinct was to reach down and grab him for further inspection, but I refrained when that nagging feeling hit me that this is the kind of place where you pick up a little lizard and get a little poisoned! It quickly made its way under our bed into one of those newly disinfected compartments! We decided to leave it be for the moment so he could come out on his own time…tough I’d gladly trade a roach for a lizard! We made our way to the kitchen to move the stove so we could finish cleaning behind it (not a pretty job). Janis asked what was in the drawer that had been tucked away and I showed him a handful of keys – what to, I have no earthly idea- and a hefty load of cockroach poo! Oh joy! He asked about the cupboard below and I had looked only moments earlier, so I told him it was empty. When I opened it to show him proof, out ran another cockroach! The obligatory squeal and a hop in the air. It’s noon and I’ve seen two cockroaches and a lizard in some very undesirable places. Not a great day to be in apartment A2! The only positive effect of these visits? I’m sure my heart is getting a better workout than it’s had in years!